Fever and Hives | I Have A Fever and Hives, What Does It Mean? I Have A Fever and Hives, What Does It Mean? Hives are also known as urticaria and are generally caused by an allergic reaction your body has to an allergen. Fever and hives most times means that your hives case is due to an illness, but is not a symptom of hives. Urticaria has a few different types including physical hives, acute hives and chronic hives. Physical hives can be due to heat or cold exposure or differences in temperatures. Going from a warm area to a cool area can cause this type of hives. Sun exposure is also associated with this type of hives (AKA Sun Hives). Acute hives are cases of any type of hives that lasts less than 6 weeks while chronic hives are cases that persist longer than 6 weeks. Hives are your body’s reaction to an allergen. This means that when your immune system thinks that there is an allergen present, it releases histamines into the blood stream to fight it off. It doesn’t matter if the supposed allergen is a medication, insect bite or sting, food (such as egg whites with my toddler) or food additive, even temperatures and illness; the immune system still sends the same chemicals to do the job. When the histamines reach the skin area of the supposed attack, it causes itching and swelling as well as the pale centered red welts on the skin. 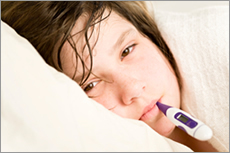 The most common reasons for having a fever and hives is the flu, hepatitis B, parasitic worms and even strep throat. This is true of any illness that causes a fever, and hives will accompany the illness. You may not have ever had hives before with this illness, but as we get older our bodies go through chemical changes. If you were allergic to aspirin as a child you may grow out of that allergy. Also, if you have never been allergic to peanuts before, you could all of a sudden develop this allergy. Allergies such as hay fever can even cause hives. Fever and hives are associated together because there are so many types of illnesses that are capable of producing a fever, and any of these illnesses can cause hives. Even if you have a low fever and hives, it is best to treat the cause of the fever and not the hives at first. Hives are itchy and sometimes have a burning sensation and this can make them quite unbearable depending on the location. If you have an infection, the faster you get rid of the infection the faster the hives will go away. Sometimes hives can last for a few hours or even a few days after the illness is gone. This is a residual illness in itself, and can be treated with over the counter medications. However, if you want to avoid the side effects of these medications and simply be rid of the hives for good, use OxyHives. Our treatment page offers information on the ingredients, side effects and uses of this product.